When Gerald “Jerry” Stephens met Hopkins urologist Brian Matlaga several years ago, he was in pain. A lot of pain. Not long after the surgery, Stephens approached Matlaga with all sorts of questions about his work and research about stone disease — and an offer to help. So began a partnership that became a friendship, and a friendship that became a legacy. Shortly before his death in August, Stephens and his wife, Helen — who’d already endowed a professorship that Matlaga holds — made a gift to establish the Gerald D. and Helen M. Stephens Center for Stone Disease in The James Buchanan Brady Urological Institute at Johns Hopkins Medicine. Matlaga will serve as the center’s inaugural Stephens Director. 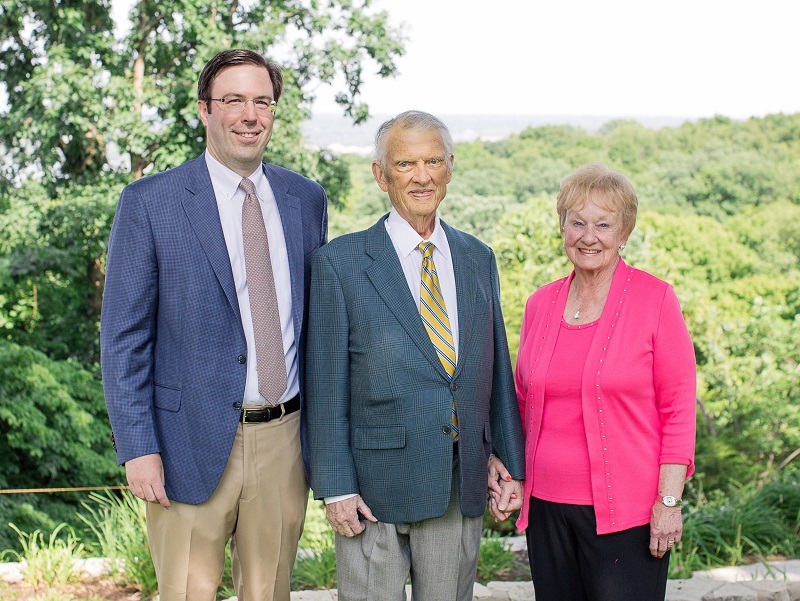 The Stephens Center creates a permanent foundation for work Matlaga began after receiving the Gerald D. and Helen M. Stephens Professorship in 2015. Funds from the chair have helped Matlaga partner with other investigators to identify outside-the-box approaches to improve stone treatments. For example, his work with Dan Stoianovici, director of the Urology Robotics Lab, enabled them to better understand the kidney and bladder stones Hopkins urologists were operating on. One of the Stephens Center’s earliest goals is to collect this information into a master dataset that Matlaga and his colleagues can study. The goals: to predict why stones form, which people are most at risk, when stones are likely to form in these people, and how they can best be treated. It’s research that has the potential to impact millions — stone disease affects more than 10 percent of the United States’ population and is trending upward. The center’s resources advance The Brady’s — and Johns Hopkins Medicine’s — teaching mission, too. Stephens Center fellows are trained not only to be exemplary surgeons but also advanced researchers. Matlaga stresses the latter education may be even more intensive than the first. And philanthropic support is increasingly critical because research about stone disease has been historically underfunded when compared with other diseases, such as cancer. Gifts like those the Stephens made over several years give people like Matlaga the ability to ask and answer questions that aren’t being asked elsewhere, yet could lead to advances in medical care and improved quality of life for many people. “Jokingly, I told Dr. Matlaga that if he’s successful, he’ll put himself out of business,” Stephens said. (l-r) Brian Matlaga, Jerry and Helen Stephens during a July 2018 event held in the couple’s honor. Stephens’ wit — shared over meetings and dinners during the years of their friendship — is something Matlaga will miss about the longtime Brady Institute Advisory Board Member. He’ll also miss the wisdom Stephens shared about leadership gleaned from his experiences in the Korean War and as the founder and chief executive of several companies, including RLI Corporation, a nationwide specialty property and casualty insurance company. Editor’s note: Gerald “Jerry” D. Stephens passed away on August 20, 2018. He was 86 years old and is survived by his wife of 52 years, Helen Stephens, four children, and seven grandchildren. Interested in supporting innovative medical research like Brian Matlaga's at Hopkins?